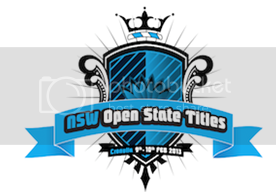 2013 NSW Open State Titles Open Womens division was won by Steph Single at Sandshoes in southern Cronulla in powerful three-foot waves today.Steph didn't drop a heat on her way to the final even scoring a 10 in her quarter final.Steph claimed the Westfield Miranda Wave Of The Day and scored a voucher to Westfield Miranda for her efforts. With a gusty southerly wind that began to tear through the lineup around lunchtime, all girls scratched into anything that moved. Newport's Holly Wawn held down the lead for a chunk of the heat until Steph caught a punchy little righthander that propelled her into first position. "I was just having so much fun out there. I was looking to build my scores early with some mid-range fours and fives and to go from there."